Each new online store that’s yet unknown and unpopular wants to be like that pale kid from Project X - suddenly in a limelight, with lots of people admiring him and stuffed with ecstasy. I’m joking, but you get the point - acquiring new clients is the #1 task at first. But later on, store owners should concentrate more on the customer retention, as the probability of selling to a new customer is 3 to 14 (!) times less than to an existing one. So, what’s the secret of keeping your customers loyal and interested in your store for a long time? As always, it’s money - offer rewards for staying. As in relationships with your spouse, it’s important to keep surprising your clients and giving them presents. 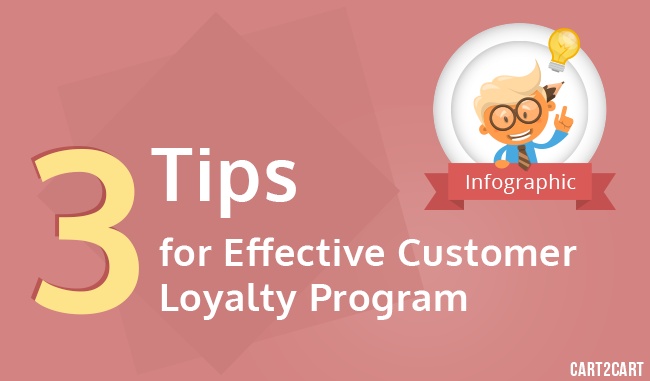 Today, we’ll describe the 3 tips for creating effective customer loyalty programs. Hopefully, they’ll help you turn each one-purchase stand into a happy, long-lasting romance! Not only is it useful to give presents for purchases, which you ought to do certainly, but it’s also a good idea to reward them for referencing you. Whether it’s likes on Facebook, mentions on blogs, referred visitors - pay shoppers for every effort to promote you. According to BusinessWeak, 90% of US online shoppers participate in a reward program of some type. So now, when they’re spoiled, they won’t even look at the store not providing extra benefits. Put that knowledge to use. Discounts are effective but also overused. They’re not the best nor the only tool to retain customers. Instead, in order to encourage repetitive purchases, we recommend attention and clarity. Write all product descriptions distinctly, without bombarding readers with much technical terminology, and provide them with the always accessible support channel (online chat is clients’ favorite). That way, you’ll make them feel cared about! Over 44% of customers believe that online support is one the best advantages a store can offer. Give them what they want! This is something we can borrow from physical business. It’s to do with the feeling of appreciation and respect, which people love. When a shopper brings you substantial profits - contact and thank him personally, you - the store owner. He’ll be flattered, and in a tie with other uplisted methods, it’ll contribute a lot to building friendly and trusting relationships with your customer. The following infographic from ecommerceCEO.com will teach you more about the value of loyalty programs. Enjoy! So, make your retailer a go-to place when clients need great products, reliable support and respectful attitude. They’ll thank you by coming back. Cart2Cart team wishes you the best of luck!